I hold degrees from Hartt School of Music (University of Hartford) and Northwestern University School of Music. 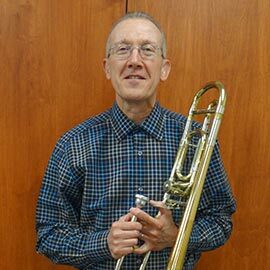 I was appointed principal trombonist with the Kitchener-Waterloo Symphony and the Canadian Chamber Ensemble in 1983 after playing eight seasons as principal trombonist with Orchestra London. I have performed with the New Hampshire Music Festival Orchestra, Hamilton Philharmonic and Civic Orchestra of Chicago and played at the Elora Festival, the Stratford Festival, the Westben Festival and the Festival of the Sound. I have taught trombone at Laurier since 1983. Trombonist with the United States Military Band at West Point. A 4 year Bachelor of Music is an opportunity for tremendous growth as a musician. It is a great pleasure to work with students that are interested, motivated and have strong work ethics.